The Ideal Dairy Company was in business from 1912 to 1918 and possibly a little longer. The company was listed the the 1914 through 1917 Brooklyn Classified Telephone Directories and there are references to the company in a 1912 Brooklyn Eagle Story. Their address was always given as 203 20th Street in Brooklyn. They were not listed in the 1910 or 1920 Brooklyn Classifieds. The 1913 -1914 Copartnership and Corporation Directory listed George Ihnken as President and Director. Prior to 1914, George Shukens was President. The 1915, Directory of Directors in the City of New York listed Ihnken as Vice President of the Dairymen’s Manufacturing Co., as well as President of the Ideal Dairy Company. The company was listed as a licensed milk dealer by the NYS Department of Agriculture in the year ending September 30, 1915, the only year I could find. That year, the Department of Agriculture also listed them as the proprietor or manager of a dairy plant in McClure New York. The company was convicted of not properly labeling their milk bottles on at least two occasions in 1913. At the time, according to the Sanitary Code, milk had to be graded and labeled as A, B or C according to the bacteria contents and the score made in a government test at the farms where the milk originated. 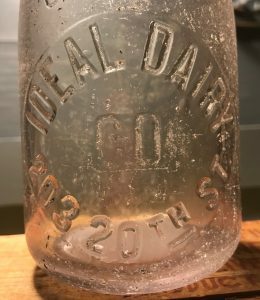 The Ideal Dairy Company of 203 Twentieth Street of which George Shukens is President was four times convicted of not putting labels on its bottles denoting the grade of milk. The Ideal Company pleaded guilty and sentence was suspended. The Ideal Dairy Company, by representative, pleaded guilty to a charge of not properly labeling its bottles and sentence was suspended. The lack of labels could potentially have lead to “C” milk, which was fit for cooking or manufacturing only, being used for consumption. 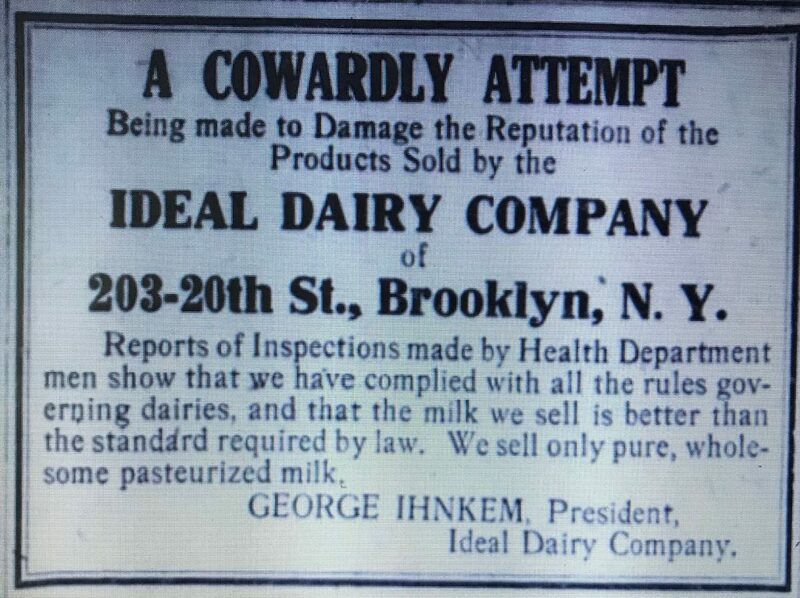 Residents of South Brooklyn and Bay Ridge have begun sixteen suits asking a total of $306,000 damages from the Ideal Dairy Company of 203 Twentieth Street, Brooklyn, alleging that milk sold by it during 1915 caused some of those who drank it to be stricken with typhoid fever and was responsible for several deaths. Summons and complaints in the actions were yesterday filed in the King’s County Clerk’s office. George Ihnken, understood to be the proprietor, was not at the plant yesterday, but it is said that the charges made will be vigorously denied. Parts of South Brooklyn and Bay Ridge were affected by an outbreak of typhoid in 1915, but the cause was not officially established. On the same day that this story appeared, the Ideal Dairy published an advertisement denying the charges and defending its reputation. I haven’t been able to determine who prevailed in the law suits but within two years the company was no longer in business. The bottle I found is a machine made pint that fits a 1912 to 1919 manufacture date. Next Next post: Hardscrabble Farm Dairy, East Hampton, N.Y.